On January 19, the final day of Kenyatta's In Real Life: Studio series at the Hammer, she will relate her explorations about the erasure of Black women historically and presently to modes of displacement through gentrification that primarily affect Black and Brown families and historical landmarks. The public is invited to participate in a movement performance to combat these erasures collectively. Materials generated through this public participation will be placed within an installation at 18th Street Arts Center, where Kenyatta is in residence through April. For In Real Life: Studio at the Hammer Museum I will be workshopping a performance that to present during my upcoming solo exhibition at the California African American Museum in February of 2017. At CAAM I will present a new body of work focusing primarily on the concept of disappearance and erasure as it pertains to the current 64,000 missing black women in America and historical disappearances of Black women throughout the African Diaspora. I will create un-portraits of elusive figures that cannot be codified or exist only as entities and presences stemming from historical and contemporary acts of disappearance via homicide, colonial entities, the current human trafficking trade, and other forms of erasure. With this new body of work titled The Evanesced I want to create a new space to visually reimagine mourning, awareness, trauma, and exploring the demonic landscapes that pose danger to the Black female body. I will continue my existing aesthetic practice of working with layering and figurative abstraction, oscillating between visual sources from the 1980s and early 1900s. My interest in disappearance as it pertains to Black women in the Historical Present has shaped all of my bodies of work to date. I am haunted by the disappearance of Black women being accepted as the norm; society has come to know it so intimately that we are desensitized. Fraught with intense layers of intersectionality, societies form perpetual blind eyes to the treatment and the threat of violence upon Black women. As a Black woman I am fascinated with how we are taught to value and de-value our presences within American society and abroad. In light of so many black women being killed at the hands of the police (Sandra Bland, Rekia Boyd, Shereese Francis, Kathryn Johnston, and countless others). The Evanesced is an investigation embracing a collective, #SayHerName mentality of mourning, awareness and healing. Through my research and connections with the Historical Present my studio practice is inclined to explore work that is a collective cry for the disappeared, the misunderstood, mispronounced and misused women of our past, present and future if we continue on the current paths concerning the hyper sexualization of, the usage of language about, and the perceived criminalization of Black women. I am reminded of my grandmother telling me when I was in high school not to wear a silk scarf around my neck if I was walking down the street alone, because someone could come up behind me and choke me with it. While on a class trip to Spain in 2007 I had a firsthand encounter with my blackness as a woman being synonymous with prostitution and the human trafficking trade; I could have easily been harmed by the four men who visually and verbally sexually assaulted me throughout the landscapes of Spain. This collective and generational violence embedded within our social fabrics is something that is both a lived experience and also a theoretical entity that follows our bodies perpetually. During my performance I will embody various types of women navigating historical and present situations in which I become a shape shifter morphing in and out of presences. I will experiment with a soundtrack that will include whispers, shuffles, snippets of blues music, reggae, jazz, bluegrass, hip-hop and R&B that will create a indecisive sonic portrait transitioning into various realms of being and unbecoming that will create tributaries of emotions informed by the Black female experience. 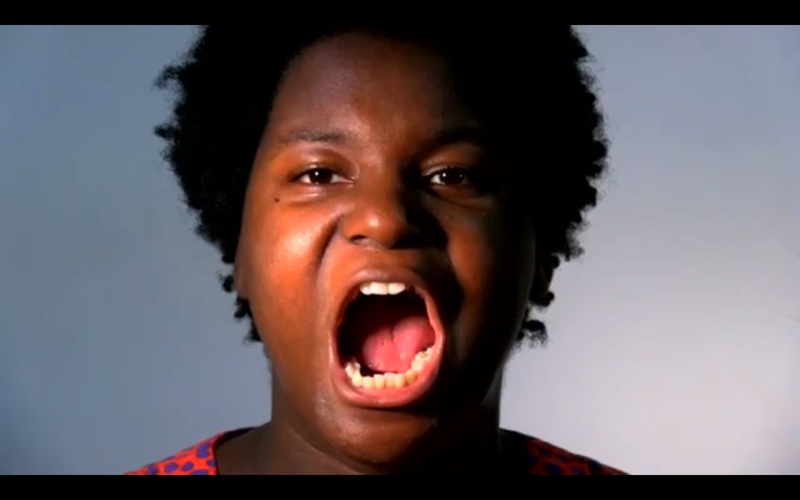 Kenyatta A.C. Hinkle is an interdisciplinary visual artist, writer, educator and performer. Hinkle lives and works in Los Angeles and Oakland, CA. Her practice fluctuates between collaborations and participatory projects with alternative gallery spaces within various communities to projects that are intimate and based upon her private experiences in relationship to historical events and contexts. A term that has become a mantra for her practice is the "Historical Present," as she examines the residue of history and how it affects our contemporary world perspective. Her artwork and experimental writing has been exhibited and performed at The Studio Museum in Harlem, NY, Project Row Houses in Houston, TX, The Hammer Museum in Los Angeles, CA, The Museum of Art at The University of New Hampshire, The Museum of the African Diaspora (MoAD) in San Francisco and What If The World Gallery in Johannesburg, South Africa. Hinkle was the youngest artist to participate in the multi-generational biennial Made in LA 2012. Hinkle’s work has been reviewed by the Los Angeles Times, LA Weekly, Artforum, The Huffington Post, The Washington Post and The New York Times. Hinkle was listed on The Huffington Post’s Black Artists: 30 Contemporary Art Makers Under 40 You Should Know. She is also the recipient of several fellowships and grants including: The Cultural Center for Innovation’s Investing in Artists Grant, Social Practice in Art (SPart-LA), Jacob K Javits Fellowship for Graduate Study, The Fulbright Student Fellowship, and The Rema Hort Mann Foundation’s Emerging Artists Award. Her writing has appeared in Not That But This, Obsidian Journal, IPI Press and she has a forthcoming essay in an anthology called Among Margins: Critical & Lyrical Essays on Aesthetics edited by Fox Frazier- Foley and Diana Arterian. She is represented by Jenkins Johnson Gallery in San Francisco, CA.